If you’re a startup and using multiple software applications simultaneously during calls, you’re not alone. BUT…you can’t go on like this. CRMDialer is an all-in-one suite and award-winning solution engineered to reimagine your “call game.” Uniquely designed with startups in mind, CRMDialer is a white-label CRM and communication suite that streamlines your sales process and customer service. 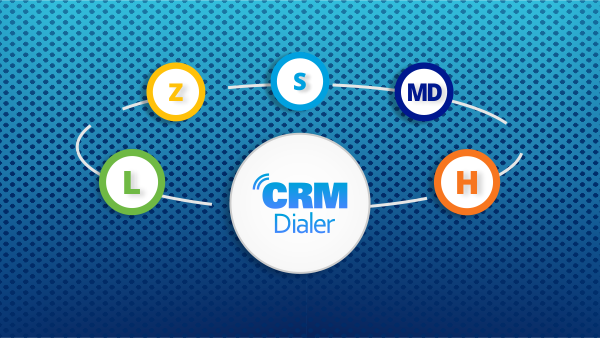 Instead of relying on multiple software applications, you can use CRMDialer to bring everything under one roof. Stay organized, save time, and save your sanity – with an easy to deploy CRM that puts the power in your hands. Featured on Entrepreneur and CRMBuyer, our intuitive system allows you to power up your outbound and inbound sales. It’s easy to deploy and use immediately, with an unlimited number of users. CRMDialer helps you grow your business, with the ability to contact triple the prospects. Boost team efficiency, enhance productivity, and beyond. No caps mean no limits, and no extra per-user charges. When using a CRM that doesn’t bill per user, you automatically position your company for increased growth and decreased expenses. For the same flat fee for everyone in your business, you can move mountains. “My sales team is too big,” said nobody ever. Your team can never be too vast when it comes to growing your business exponentially. Whether you have 20 or 200 sales agents, you’ll still pay the same flat fee. It’s just the way it should be, don’t you think? CRMDialer hit the market in April 2018. Our founders had a vision of creating a power-packed platform and leading CRM solution. Today, our management platform provides full-service telemarketing and CRM solution for business of all shapes and sizes. Our sophisticated solutions give our clients everything they need to optimize sales and business operations, with unlimited users. Our vision always has been, and always will be, to place a plethora of effective communication tools at the fingertips of agents worldwide. This allows salespeople to keep leads on their toes, constantly curious about what you have to offer as a business. CRMDialer is the industry’s leading Power Dialer CRM tool, helping you focus on leads and customers, not I.T. You’ll get everything you need to track and close more deals with integrated CRM email and calendar. CRMDialer fuses the 8 things that matter most – calling, call recording, SMS, email, tracking, reporting, payments and support. CALLING: Improve your service quality and customer satisfaction with professional calling tools at your fingertips. Make more calls, in less time, by boosting every agent’s productivity. They can make calls directly from their browser, engaging more prospects to potentially triple your sales. CALL RECORDING: Knowledge is power. With the ability to listen in on ANY incoming and outgoing sales conversations, your managers can identify problems before they become bigger problems. What’s more, granular area code controls mean you can disable call recording at any time. By listening in, managers can advise agents to become better and better as time goes on. The best part? You can stay compliant with state laws with minimal extra effort – something we understand is a priority for every business. CRM administrators can easily disable CRMDialer’s automated call recording feature for any area code in seconds. Please make sure you’re totally familiar with the FTC’s two-party consent recording regulations. 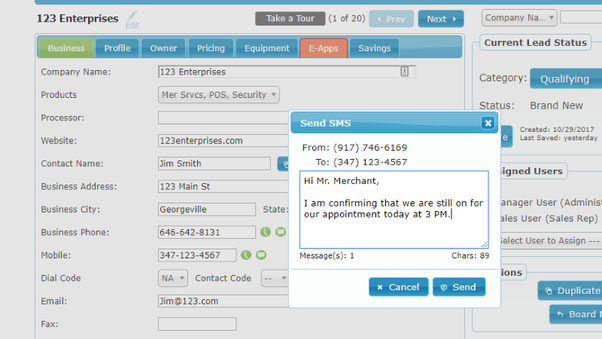 Send and receive text messages directly from the CRM with the click of a button. SMS: Inbound and outbound text messages are a key part of the sales and follow-up puzzle. Convert more prospects into more clients by integrating SMS into your system. After all, research shows that it takes the average person a mere 90 seconds to respond to a text. Smartphones are the one thing your prospects never go anywhere without, making SMS the perfect pedestal to propel your business forward. Digital Marketing Magazine revealed that 75% of people want offers sent to them via SMS. 65% of marketers agree that SMS marketing is a highly-effective tool (web.com). With CRMDialer, you can send SMS’s to any number worldwide – a smarter way to communicate with leads through personalized messaging that strengthens your business-customer relationships. Did you know that you can also increase your response rate through SMS? With the ability to send SMS’s directly to your prospects from the CRMDialer system, you can send your response rate soaring to over 80%, closing deals faster than ever before. By signing up for our UNLIMITED Pro Plan, you’ll get 10,000 SMS messages to send each month. EMAIL: Contrary to what many people believe, Email Marketing DOES work. With CRMDialer, you can send, receive, and automatically bind emails with customer and prospect records. Use Gmail, Outlook, or your SMTP account of preference. Research indicates that email marketing has an average ROI of 3,800%, and is the 3rd most influential information source. In 2017, there were 3.7 BILLION email users globally, a number that is only on the rise according to LeightonInteractive.com. Grow your business with website visitor tracking by turning typically anonymous traffic into valuable data. TRACKING: Start conversations with prospects and clients, and keep them going, through click-by-click notifications that provide real-time insight as to when people are visiting your website. With this data in tow, you can make more informed business decisions. Understanding the behavior of the people who visit you online is critical for increasing conversions. With CRMDialer, you’ll be notified the moment a visitor enters your website for the first time – and every time after that too. With this knowledge at your agents’ fingertips, they’ll know what prospects are looking at, and for how long. This way, your agents can keep prospects engaged better – bringing an end to the vicious cycle of cold calling. WARM and HOT leads are the key to more sales! REPORTING: With CRMDialer, every outgoing call made with the dial button is logged and available for reporting. You’ll receive regular reports via email regarding your staff’s call activity. This way, you can manage performance better, identify room for growth, and ensure that everyone is doing what they’re supposed to be doing at all times. PAYMENTS: Easily collect customer payments, processing e-cheque and credit card payments quickly and easily. Our existing clients love the fact that CRMDialer is totally compatible with every merchant account – yours included – making for easy payment processing acceptance. You can submit transactions to receive fast and secure deposits, swiftly bringing client balances back to $0.00. There are no hidden fees, and you’ll receive accurate reporting at your fingertips. No delays. No nasty surprises. All major credit cards are accepted. CRMDialer’s CRM billing suite is ideal for a range of markets, making it the ultimate all-in-one solution to collect customer payments and stay ahead of the game. Send receipts, receive deposits directly to your bank in just two business days, and beyond! Our payment system features a refreshingly intelligent design, enables recurring payments, reduces AP workload, and provides in-depth fields for processing in seconds. SUPPORT: We are not a “fly by night” kind of team. When you place your trust in us, we’re “in it” for the long haul. We provide uncompromised support around-the-clock should you have any questions, queries, or concerns. In an effort to further maximize your experience with us, we also regularly post on our blog. Check it out at crmdialer.com/blog/home/ to access the latest sales tips, platform comparisons, featured functionality, and much more. Our “secret sauce” is our implementation – a premium blend of personalized customer service, superior support, and state-of-the-art technology you won’t find anywhere else. We created CRMDialer out of a passion for helping businesses work smarter, not harder, with one system you can rely on to grow and manage your entire business. View lead pipeline status from one easy-to-navigate dashboard. Keep agent calendars up-to-date with appointments and tasks. Set up email campaigns with a low bounce rate by importing lead lists through our email validation tool. Confirm that sales reps are using visitor tracking notifications to contact prospects more proactively. Finalize client agreements, quicker and easier, by sending e-signature enabled documents – online or offline. On-site call center systems are heavily flawed, becoming quickly outdated in today’s technology-driven business landscape. Soon, physical call centers will become entirely obsolete. As a forward-thinking business, you MUST get with the times and stay ahead of the game – before you fall behind. A cloud-based dialer can (and will) make the world of difference for your business. You can plug in a headset and start making calls immediately using US-based phone numbers. With a cloud-based dialer, you can cost-effectively scale your call center, all without compromising dependability or security. As a cloud-based call center, CRMDialer is changing the way businesses think and operate. We’ll host and maintain your call center on your behalf, so you can focus on what matters – expanding your empire. CRMDialer makes it easier than ever to ensure that everyone is on track to hit their performance goals. We understand that there are countless CRM solutions out there, making it harder than ever before to pick the right one for your needs. We’ve made the decision easy for you, by fusing all the PROS of EVERY great solution out there. Our revolutionary power-dialer CRM platform bridges every gap in the market while empowering small to medium-sized businesses with the innovative tools they need to skyrocket performance and, in turn, sales. If you want to be able to make lightning-fast calls from your browser, CRMDialer is all you need to take your business to the next level. We make it easy to get in touch more and sell more through an integrated phone for making and receiving calls. Training and setup are part of the package, as is the ability to organize inbound and outbound calls in your office. Busy agents are no longer a problem with CRMDialer. You can places calls in a queue when sales reps are otherwise preoccupied. You can also control the ways in which calls are distributed to agents, while allowing them to “cherry pick” upcoming calls. What’s more, the conversation doesn’t have to stop just because callers are placed on hold. Why not use this opportunity to market your services through high-quality on-hold recordings? When it comes to converting prospects into loyal clients, every second counts. With CRMDialer, you can turn intricate daily tasks into organized bliss. In today’s fast-paced business world, CRMDialer is a no-brainer. If you’re like any other business, we’re sure you want to increase your profits, nurture sales reps to become more efficient, and of course, minimize stress. CRMDialer helps you achieve all of the above and so much more – and getting started is so easy. Get in touch to request your FREE DEMO today. Doing so will give you a 100% free taste of what CRMDialer can do to help your business grow – and keep growing for years to come. If you’re looking for another reason to trust us, you can find solace in the fact that we have been featured by global creative powerhouse, Adobe, as a trusted CRM partner solution. We share the spotlight with the likes of Salesforce, Microsoft, Oracle, and more. Since our inception, we’ve been hailed as “Salesforce on steroids.” If that doesn’t move your finger to your mouse to click on GET FREE DEMO, we don’t know what will. Sales and Marketing Automation: What are some inexpensive alternatives to HubSpot, Marketo, and Pardot?